OK I have managed it - while having a wander and shoot session I have taken a photograph and when it has come to tagging realized I do not have the foggiest idea what it is of. This is a detail of the front of the mineral water hospital in Bath - there is one either side of the front door and they look like they could have been seats but have these large metal spikes - I would say it was something to stop people sitting but they look like they have been there for a long time possibly since the stone bits were first put there in which case they were never intended as seats and may have had some other purpose. I have put some basic tags on to get the photo on sale but would really appreciate it if anyone knows more about what these are and what they are for. They are there to stop people getting up to scratch their names on the wall behind. Don't seem very effective, do they? Have they got a technical name do you know? 2. 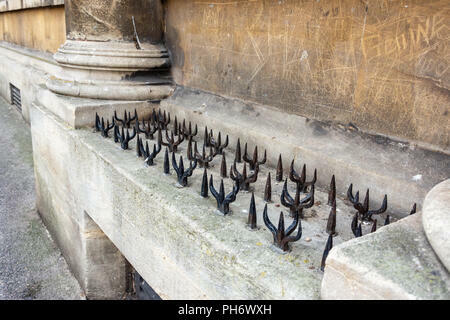 Anti-homeless spikes, a phenomenon of "hostile architecture". Presumably meant to deter rough sleepers. Or maybe also deter skateboarders from performing tricks and damaging the building, and stop people sitting on the wall. I did consider that but they seem way too old and long-standing - most anti something spike things are ugly and galvanised and look modern savage - these look medieval savage - although I guess that could be deliberate to try and keep them "in character"
OK I just did a google reverse image search - and got "Best guess for this image: canada goose"
I am not quite sure what to make of that. No idea what they're called, but it looks as if the hospital is trying to drum up some business (or lawsuits). According to local knowledge they were installed back in the day (1700's) to deter beggars from sitting around the front entrance, upsetting the more wealthy who came to take the waters. They are to stop people sitting on the wall. Sorry I was joking AGAIN. Slap wrists. Ah my apologies - I have enough problems with people getting totally the wrong end of the stick when I am typing I should be looking out for dry humour. The trouble is with text it is so easy to only read it literally. we have alot of these here...it's to prevent people from sleeping there. That's OK I quite understand. I think the older hands are used to me now and know what I am about. BTW Welcome to the club. (Alamy I mean). No worries happy to help, loads of help and advice available on here. I should be looking out for dry humour. The trouble is with text it is so easy to only read it literally. Yes, but this is Allan we're talking about here. Seems I am getting a reputation. Is that good or bad? I dunno, but it's perfectly clear that they're actually to stop golden eagles from landing. Oh dear, another group of people not yet aware of a certain quirk I have - although you are getting off lightly here as the challenge is not that extreme. Just be glad you were not the one who told me there is no way I would do rocky horror basque and suspenders and walk into a St Johns badgers session (that's like cubs if you are not aware) and kiss the guy running it. Probably the funniest bit was her trying to decide to chase me up the road and stop me or hide and pretend it had nothing to do with her. Just to keep it interesting I do not respond to every challenge - that would make it too easy on people - but many many people have decided over the years its not worth the risk that I might actually do something. Give it till the next update and search it.